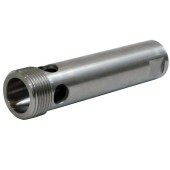 Held against tube opening to prevent an operator from being exposed to waterjets. 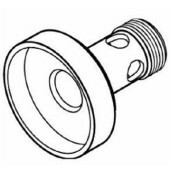 Includes three stop sizes to work most common flex lance sizes. 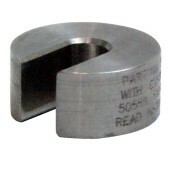 For use in Flex Lance Safety Grip with 26104 (4/2) or 28596 (3/2) series flex lances. Prevents flex lance from backing out through the safety grip. 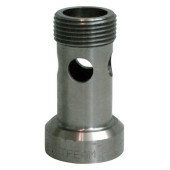 For use in Flex Lance Safety Grip with 26106 (5/2), 51953 (5/4), or 51952 (4/4) series flex lances. Prevents flex lance from backing out through the safety grip. For use in Flex Lance Safety Grip with 26108 (6/2), 51954 (6/4), or 28460 (4/6) series flex lances. Prevents flex lance from backing out through the safety grip. 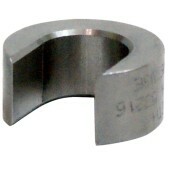 For use in Flex Lance Safety Grip with 27560 (8/2), 53816 (8/4), or 27731 (5mmUHP) series flex lances. Prevents flex lance from backing out through the safety grip. 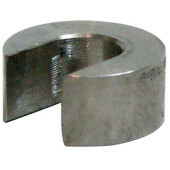 For use in Flex Lance Safety Grip for tubes up to 1 in. (25 mm) OD. 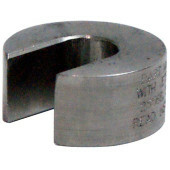 For use in Flex Lance Safety Grip for tubes up to 2 in. (51 mm) OD. 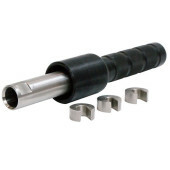 For use in Flex Lance Safety Grip for tubes up to 3/4 in. (19 mm) OD. 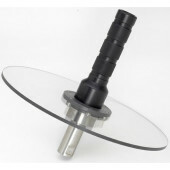 For use on Flex Lance Safety Grip to deflect blowback exiting tube away from operator.